This is awesome! Did you guys see that the author from Creating Customer Evangelists posted on my blog! This is a guy who lives what he teaches and you'll see what I mean when you read the book. The info in this book applies to our industry possibly more than any other! Read it! Right on! 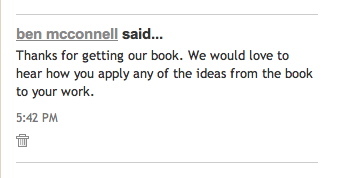 You know you're cool when the author of the books you're recommending seek out you! Who else? Is Tim Sanders trolling too? How about Bono?? I love it! You started the spell man! Love is the Killer App was like injecting me with some drug that addicted me to reading.